Today I am unintentionally patriotic and I like it. I didn’t actually realize this until I saw the calendar and it’s July 3rd and here I am in red, white and blue. Also, someone tried to pledge allegiance to my dress, so there is that. And if you think this outfit is patriotic, just you wait until tomorrow. There might be fireworks coming out of my shirt. So I remember now why I don’t cut bangs; they grow like crazy. Do you hear that the rest of my hair? The bangs are beating you in this race. 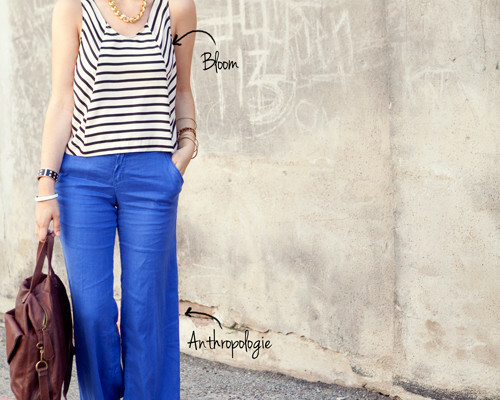 love your hair and this outfit! love this!!! that dress is beautiful. Enter my GIVEAWAY to win a nautical striped blazer! Oh I love this. 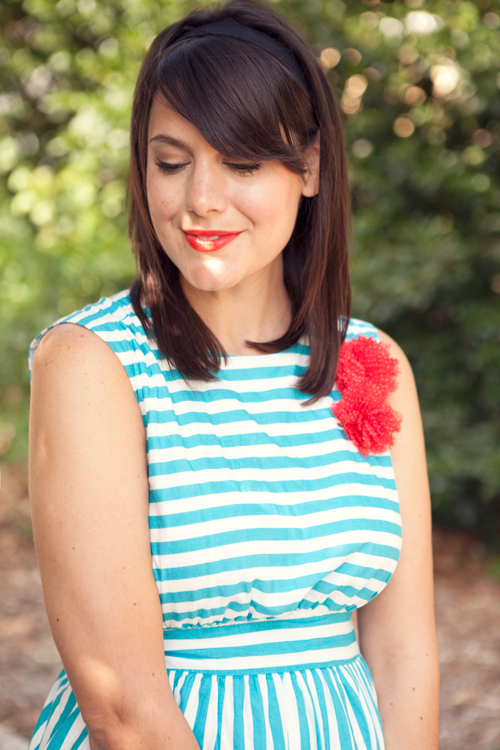 Super cute dress, the flower broaches, the hair hand – it’s all lovely! I love this look! That dress is stunning on you, and your hair looks so cute. Such a pretty dress and I love that last photo. You look so beautiful. And I still think your bangs are awesome. haha I inform the rest of my hair about my bangs’ progress all the time 🙂 I love the lipstick with the flowers! I would probably pledge allegiance to that dress; it is gorgeous. You look so carefree and summery. It always seems like the shorter hair grows faster than the longer… I dont know why that is… Anyway, sper cute dress! LOVE love love this dress!!! I like your patriotic look! Cute dress…perfect for summer. I have the same problem with my bangs…they’re the perfect length for about three days, then they need a trim…goodness forbid I trim them myself! This dress is so darling on you! I’d pledge allegiance to it too! ha ha.! Very pretty! what a great take on red, white, and blue. Not too patriotic or korny looking. Whoa, favorite outfit ever. The dress is probably sold out right now but I need it! I feel like I say that every week. Oh Kendi, I’m brainstorming a patriotic outfit but will mostly likely end up looking dorky and trying to pass pink and cornflower blue as our country’s colors! I love this dress…maybe I’ll shop all year to have a cute 4th outfit by 7/4/13. happy 4th! (tomorrow) your new cut and bangs look fab! I just use a tinted moisurizer from Laura Mercier. I rarely break out with it and it has an spf in there, too. I love it! Pretty dress! ModCloth has such great stuff! love your look today!!! it is beautiful!! love your hair!!!! I love the cut of that dress and the red pin! Adorable. I like the addition of the flower pin to the dress … a simple and awesome way to switch it up a little!! So. Cute. Those wedges look comfortable. 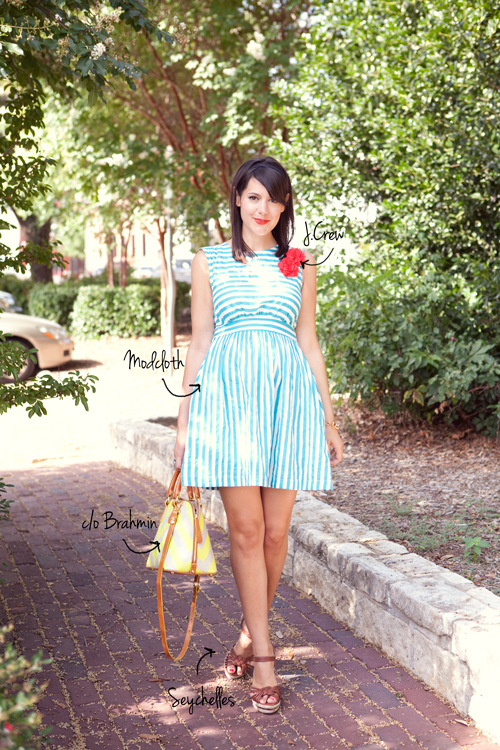 Recently saw this dress on ModCloth–you wear it well! I love the rosette pins! Also, I feel your bang woes. I love my bangs + MUST wear them because I have a five-head–but it seems they are often either too short (fresh from the hairdresser) or too long. Thank goodness for bobby pins! I think your hair looks great! Okay seriously, this dress is too cute for words!!! I LOVE it! Love the dress and flower brooch! 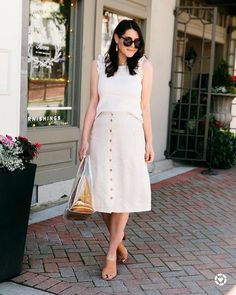 Perfect July outfit! I love the mix of aqua blue and red. I’ve got the same speedy bang dilemma, though I am trying to grow them out. I just wish the rest of my hair grew at the speed of light. I think unintentionally patroitic is the best the kind. Well done! Love this look! So sweet! The dress is so cute ! 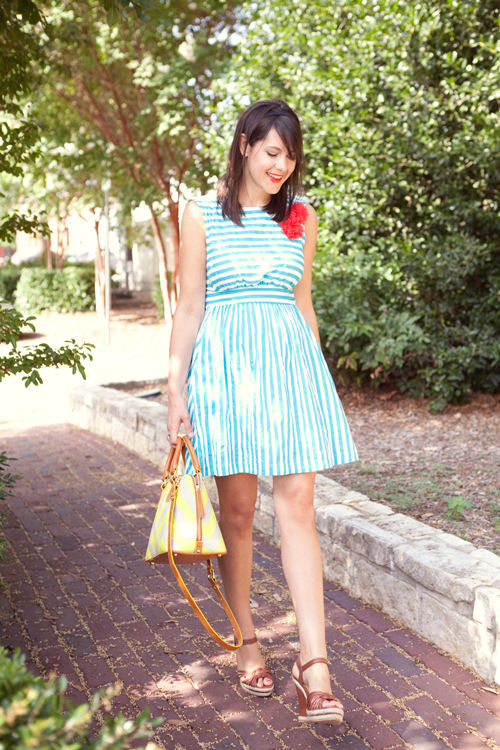 This dress is so adorable and I love those sandals! you look lovely! and that dress! oh! have a nice day! The the turquoise stripes save it from being TOTALLY patriotic. Navy would be a different story. In any event, it’s adorable. Love this dress with the red flower. And such perfect unintentional planning! Happy 4th! the dress is so cute, I love the color, perfect for summer! That is such a sweet dress! Are you gonna be wearing a firework bra, a la Katy Perry?!?!? If so I think tomorrow’s post should be a vlog!!!! but your bangs are so cute! and i love this dress. i think being unintentionally patriotic worked out for you! love love LOVE that dress!!!! I especially love the red floral accent! Stop it, now youre making me want to wear a headband. You make me want to wear stuff I don’t wear, that’s a problem. Haha! Like Katy Perry style (re: fireworks coming out of your shirt….)?? I think it’s cute! 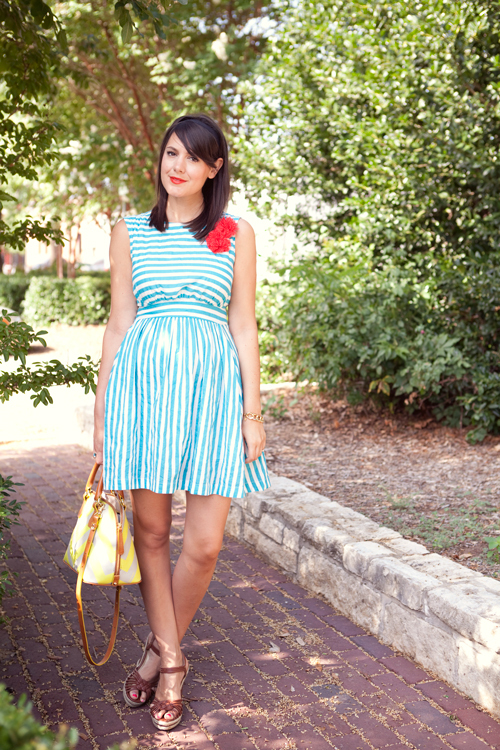 Borderline candy striper but a very summery one! In these photos you look so innocent… like a school girl. Love it! Oh wow, this is an absolutely adorable look, Kendi! I love how your lipstick matches! I know how you feel about bangs! I always think I want them but then I get them and realize how much work they are. You have to constantly cut them. Such a cute look! Loving your dress!! And you bag is amazing! Aw you look so damn adorable. I mean adorable like I'm your grandma watching you graduate kindergarten and I just want to pinch your cheeks and embarrass you. Is that weird? I. love. it. SO adorable! This dress is amazing by itself, but with those J. Crew flowers, it’s perfection. beyond classy and gorgeous! i love this outfit on you! I hadn’t yet finished reading this post when I decided that I had to write something to compliment your new hair. Mostly because it’s super super cute. And then you wrote about how fast bangs grow out. And here I was thinking I was the only who experienced this odd phenomenon! Anyway, you look super cute (as always!) and I hope you keep the bangs a little bit longer! You look so dainty and pretty in this dress. Summer certainly has some cute fashion. super girly! I love it. Oh my gosh, you look so absolutely perfect. So feminine and lady-like. 🙂 I love it! 1. How thick is your hair, and did your hair texture affect how you were able to get that style? 2. Do you ever have trouble keeping your bangs to the side? If so, how did you figure out how to fix that? I’ve tried the blow-drying your hair into submission technique, and it works for about an hour. 3. You live in a hot climate. How do you handle having bangs on your face, especially in the summer? Thanks for taking a look at this! I want to steal your bag. Just saying. I love that lipstick, it’s pretty spectacular, actually. Do you mind me asking what shade/brand it is? This is so precious. Love the matching lipstick and flower. Such a nice touch! This is just too adorable! I love the little flower detail. Lol, I am curious to see what fireworks coming out of your shirt might look like. I hope that isn’t a euphemism for streaking. You look soooooooooo sweet in that dress, the flower is a nice touch of red. Lovely shoes too. Is something going on with you? You look so different in these pictures. Your face looks really different. I don’t know what it is about it… 🙁 Hope everything is fine, I know you’re not a fan of oversharing (don’t blame you one bit). Anyway, I really love that dress. The blue in it is the perfect color for summer. This isn’t to be a smart comment by any means, but you look pregnant in this dress. And if YOU, who has an amazing body, looks pregnant, it definitely won’t work for my still-carrying-20lbs-of-post-partum body! Darn… I wanted to buy it! Hahaha, can’t wait to see your super patriotic outfit today! I’m going nuts over that dress, it’s precious! I just did a Moonrise Kingdom themed outfit on my blog, take a look! Look how gorgeous you are! This is such a pretty dress on you!